blog.samseidel.org: New York to Atlanta via rail, one man's journey. I boarded the southbound Number 19 and was directed to my cabin. The train wasn't departing until 2:15 in the afternoon, so I still had some time. As it was an overnight train, I would have the whole compartment to myself. I leaned back to take in the scene. Out the window across the platforms and tracks of Penn Station, I imagined a ribbon of darkness from the tunnels that struggled against the overhead fluorescent lights for control of the space, creating a netherworld in which neither dark nor light could prevail. 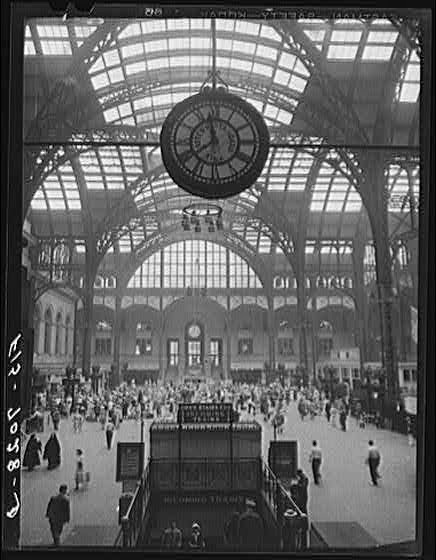 Penn Station may be the busiest passenger terminal in North America, but it is no longer the grandest, not by a long shot. That title was grabbed long ago by one of its rivals, perhaps Philadelphia’s 30th Street Station or Washington D.C.’s Union Station or New York’s other great station, Grand Central. The wrecking ball that wiped out the old Penn laid waste to one of the greatest cathedrals of American rail, with high vaulting arches that announced a kingdom of wheeled travel, but one that could not stand up to the churning power of 1960s or the arrival of the airlines. Old Penn Station a year before demolition, 1962. Down came those arches in 1963, and up went the new Penn, the impersonal modernist box that still holds sway on 33rd Street and 8th Avenue today. Penn Station waiting area 2014. At least, that’s what happened above ground. Underground was a completely different tale. The world under the earth was untouched by the wrecker’s ball or the digger’s shovel, and therefore essentially unchanged. To those who love rail, the romance of long distance train travel still lingers here. I undertook this journey to see if rail was still a viable option in the United States. 2:15 pm arrived and the great train lurched forward. The trip to Atlanta would take 19 hours. My train is called the Crescent and it winds its way south via electric power along the rails of the Northeast Corridor, stopping at Philly, Baltimore, DC before it switches to a diesel locomotive for the trip through Virginia, the Carolinas, Georgia and then west to New Orleans, the Crescent City. 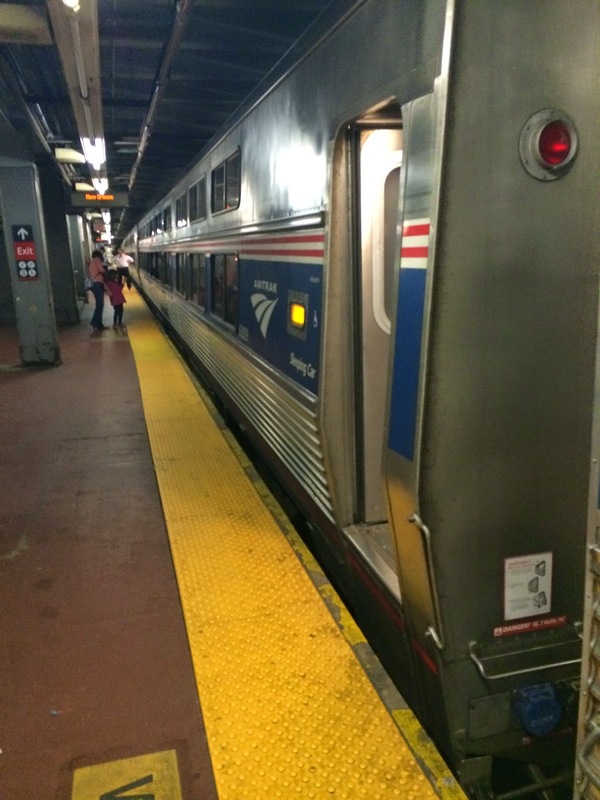 At our first stop in Newark, New Jersey a young couple with a baby boarded and took the compartment across the way. My trip had now begun in earnest. I started making notes. The woman next door is not happy. The toilet, it turns out, is located in her tiny little compartment. She wants to know why the toilets are not down at the end of the hall. To me, this is a manageable problem. To her, this is clearly not the case. Within four minutes of having walked into the cabin, she has complained loudly three times. I want to tell her to go take a plane. It turns out that my peaceful trip may be interrupted by a crying baby too. Age doesn’t bring lots of benefits, but it does bring the impression that the indignities you don’t want to deal with you don't not have to. When this isn’t the case, it’s easy to get annoyed. We rolled southward. The landscape had a particular beauty to it. I scribbled. We’re still north of Washington D.C., but it’s old industrial, there’s an old junk car lot and now a cinderblock building with Home of Cutler Egg Products stenciled on the roof. There’s a transformer and some very low small buildings and an abandoned factory as we pass the North Philadelphia station. Another abandoned factory. And is that another? There seem to be lots of them all along the way. Bricked up and left to collapse. And we have to assume the poor neighborhoods are all around them. We treat our train areas like trash dumps. We pressed on towards Washington D.C. and Union Station. The vegetation changes as you go south. That is an obvious point, but it’s a noticeable one too. There’s a flat brown stream. It’s shallow. You wouldn’t find that up north. There are trailer homes but the grass is green. The trees don’t have leaves yet here either but they are just starting. We cross a river now. A broad river and a long bridge. We must be in Maryland now. The Amtrak brochure tells me that that the tracks to Washington D.C. are owned by Amtrak, but south of that to Alexandria they are owned by CSX. South of that, they are owned by Norfolk Southern. Let’s see what happens to our pace once we’re on freight tracks. I’m sure we play second fiddle and have to wait when a freight train is passing. Washington, D.C. We are now in Union Station. All power will be cut as the locomotives get switched. To my right is a huge set of power cables sitting on a rack. An Acela Express just came into the station. In the cafe car, I overheard train attendants talking about a guy who ate in the dining car and then walked out without paying. The conductors tracked him down, but let him go. Their other option was to arrest him. In the dining car, en route. Virginia is lovely. Genteel. Two side-by-side American gothic churches, one slightly bigger than the other. A train car loaded with sections of train track. Like a toy model. The sun is setting. A Virginia farm at sunset. It’s immediately noticeable how many freight cars and locomotives are parked on adjacent tracks. We’re running on diesel power now, can max out at 80 mph, unlike north of DC, where we ran on electric and could max out at 110 mph, or so said the guy behind the bar in the café car. Two trains passed in the night. It’s 9:48pm, and we’re south of Charlottesville by about 1 hour. Fatigue is setting in, though I’d like to try to do some reading as well. Conrad. The Secret Agent. Let’s see if I can, or will I just fall asleep? The train whistle sounds. The wheels rub against the tracks as we turn. Chug-a-chug-a-chug-a-chug-a. Now, about two hours north of Atlanta. It’s impossible to say that you actually sleep on a train, but the night hours go by in a semi-slumber and before your know it, it’s 4:30am and almost time to get up. The train is stopped now, the train stops periodically on the tracks, to wait for clearances or whatnot. High-pressure sodium lamps light up a lonely parking lot. The sun has not shown its face at all, though it is 6:22am by my computer clock. That seems odd. I would think the sun would at least give a glimmer, particularly since we’re significantly south of where we started from and the days should be longer down here. It’s almost time for breakfast. The mist still lingers on the green fields. The trees are green, which is pleasant to see. Every once in a while, a dogwood is tucked back in the thick of it all, short and white and pretty. Time to pack. To prepare to de-train. The Number 19 in Atlanta. And there it was, 19 hours to Atlanta. The Atlanta train station is more befitting of a small town than a major American city. It's not connected to public transit and sits next to 15 lanes of freeway traffic. Atlanta's priorities are clear. This irony grows when we remember that Atlanta was started as a rail depot. Nevertheless, my trip told me one thing without question: long distance train travel is alive, if not kicking, in the United States. Well run, on time, comfortable, these are the words I use to describe my journey. Getting there became a pleasurable part of the experience. It's not the cheapest to travel nor is it the quickest, but it is well worth it even still.